Greedy Slimes is now available to play in your browser - No download required! Colors are important! Slimes can only eat food that matches their color. Each type of Slime also has its own personality and movement patterns, so pay attention and strategically drop food where hungry Slimes can reach it! Click to drop crates of food for your Slimes. Each crate has two colors on it but only contains one type of food. Feed each Slime three times and they'll be ready to move to the next level! Thanks so much, Jupiter! I gave your videos a Like and subbed to your channel. The game jam community really appreciates your feedback and I've already started recommending these videos to other jam participants! The concept behind this game is pretty interesting! And the game definitely eases you into it, which is good! I think the puzzle formula is really good -- you're trying to maximize the chance of feeding the right slime by putting the crate in the right spot at the right time, which is not always so easy, because you have to factor in which color you might get, who's already been fed, and 'hey is that blue boi about to jump away from me?!' :) Several small factors that coalesce into a really interesting puzzle mechanic. I like it! The music and sounds are well done and fitting. The art is minimal but also well done, and the little slimes and their expressions are cute. My only complaint is how much waiting you have to do for the right conditions to occur. Sometimes the wait is short, and sometimes you're waiting ages for blue Bob to jump next to purple Patty, but only if purple Paul and blue Barbara, those piggies, aren't around (of course Barbara swoops in at the last second). All that to say, is that I understand that waiting for the right moment is a big part of the game, but sometimes the waiting is too long. I'm not sure how this could be mitigated, maybe if you had some indirect way of influencing their movement? Or maybe if you just get more food boxes / chances? All in all, this was a cleverly designed and fun game, well done! Thanks, Naxos! Your feedback is super helpful and nicely articulated. After the jam ended, I played through it a few more times and I totally agree that there's too much waiting after about level 3-4. Your suggestion to have some sort of influence over movement/positioning is spot-on! 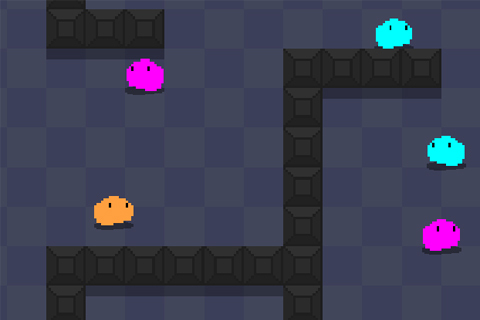 One mechanic I considered was to keep slimes moving in the same direction after they eat something, essentially letting the player point them toward the next desired area. Another idea was to allow the player to pet/praise slimes for going in the right direction, or use that ability to calm down blue Barbara's (haha, love that) and prevent them from jumping for a while. Another thing I learned during this jam was that it's generally better to cut your content short and leave the player wanting more, rather than to exhaust them with endless/repeating levels that don't add new mechanics or challenges. In retrospect, I should have cut levels 6-10 to wrap things up at about the point I ran out of design time. I really appreciate you taking the time to offer such detailed and valuable observations! Hey Tero - Thanks very much for your valuable feedback about my game! You had some great ideas about volume balancing and compensating for the randomness. I'm hoping I have time to make an improved version of the game and include your suggestions! Thank you! Challenge your puzzle solving skills across a variety of levels and keep your Slimes happy and well fed!